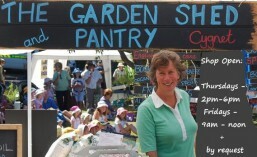 Here are the headlines from the latest news at The Garden Shed and Pantry. Don’t miss out! You can read the full newsletter here. Why not subscribe? I am about to do another order so, if you need something special or something in large quantities or feed wheat for chooks etc, please reply to this email with your order asap. Grains are available to order whole or ground into flour, from 5kgs to 20kg bags. You can check out the Four Leaf website here but do ask if you don’t see what you want as they are in the process of making a new website. Everyone is going on about superfoods, which, in general, I call superfads. However, raw cacao powder is so much better than the Cadbury’s processed stuff that I decided to sell it. Take that another step and try Barry Beach’s raw cacao beans, picked on license from the wild in Indonesia! Read more below…. I have spoken to Richard and expect to have the almonds at the next market, August 6th. You will be able to collect your paid orders from my home shop. I will send an email once they have arrived. Again you would be best to be to the market early to get some of Hugh’s very popular lamingtons, vanilla slices and GF sourdough breads at my stall. Everyone is coming down with colds and winter ills. Now is the time to care for your body by growing vitamins, enzymes and antioxidants on your kitchen bench and window sill. See all about it below…. New season’s, freshly pressed, Victorian grown sunflower oil is now in stock. New season’s, freshly pressed olive oils are on their way from Pat and Lina. More than 40 people came to our launch on the freezing cold Saturday morning of July 1st. It was a a blast, with 2 tables packed to overflowing with plants, seeds, produce, baked goods, books, magazines, eggs and more. Everyone was smiling. It was such a great vibe. Everyone is welcome to our gatherings, whether or not you have anything to share. Come for a coffee and chat. Come alone or with friends and family. Gather in my lovely shed. Join the Crop Swap Cygnet and Surrounds facebook page for updates or ask me to put you on the email list. Kevin and Cindy’s fabulous, new season’s organic, sundried fruits are selling like hotcakes! Read more below…. Lisa grows saffron on her beautiful farm at Glen Huon. I am now stocking her glass jars of saffron, which she encourages you to have refilled. This is my kind of ethical philosophy! Read more below…..